Want to work on your cannonball and jump shot at the same time? Maybe you want to make an excellent dunk compilation or get your kids to spend their summers outside. Doesn’t matter, we have a pool hoop for everyone. 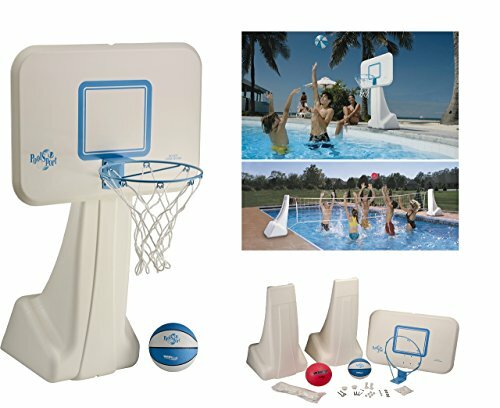 Today we are going to look at some of the best pool basketball hoops you can buy. You have a lot of options when it comes to picking a pool hoop; this gets overwhelming especially when you are unsure about what you need. For every category, we are going to review two variations – a high-end version and a budget-friendly one. If you already know the kind you want, then feel free to skip to that section. But if you are still unsure about the hoop that’s right for you then keep reading. By the end of this article, you’ll know exactly the kind of hoop you want and how much you can get it for. In-ground (also called a deck mounted) hoops are directly attached to the ground. Compared to portable hoops which can be moved anywhere, deck mounted hoops are generally fixed to one spot and are much sturdier. Deck mounted hoops are also the most expensive kind and are a long-term investment. Looking for a basketball system that’s not going to fail you? The Dunnrite clear In-ground hoop might be the one for you. While some may be pushed away by $500+ price tag for a pool hoop, those who have bought it know that it is worth every penny. One of the biggest problems with pool hoops is rust, that’s why you will be glad to know that this hoop comes with high-quality 100% stainless steel. This makes it completely immune to rust. Thousands have already purchased this hoop, and not one of them has noticed any rusting. Even after many years of use. The manufacturer has clearly gone to great lengths to create the perfect basketball system. This can be seen with the amount of effort put into even the smallest things like the design. The white and blue backboard fits masterfully with the sleek steel poles to create a minimalistic design that will up your pool decor game. Okay, I have to admit. This hoop might be a bit of an overkill. But if you ever wanted to throw down some mean looking dunks on a pool hoop. The first team hydroshot select is a one-of-its-kind hoop that’s built to handle all kinds of abuse. It even has a breakaway mechanism built directly into its rim, that’s exactly like the ones you see on regulation hoops. If you want a ring, you can dunk and hang on. This is perfect for you. It is a really really heavy system, and you are not going to be able to move it once it is set up. The entire system has a bulky appearance that will look out of place on your deck. If an in-ground system might be a bit too permanent for you. You should check out a portable hoop. A portable basketball hoop is not fixed to the ground. It is held in place with some weight. You just have to fill the base with water and you are good to go. Because a portable hoop is not fixed to the ground, it is much easier to setup compared to an in-ground hoop. You can even stash it in your storage when it’s not in use. This makes it perfect for families looking to add some fun to their summers in the pool without investing a ton of money. Since the hoops are completely portable you can place it in your storage unit when it’s not being used. Making it perfect for families who have guests over often. Includes two 17" wide x 19" deep x 38" tall bases. Cannot play both games at the same time. The basketball rim stands at a fixed height 36 inches above the deck. I’m not gonna lie. The dunrite caught my eye mainly because of its name. As a fellow connoisseur of puns, I had to respect the joke. But when I looked into it I was pretty impressed with its features and reviews. The system comes with a 13.5-inch stainless steel rim meant to withstand even the saltiest pool waters. The cool thing is that this rim is especially vinyl coated as an extra layer of protection against rust. The hoop comes with a 3-year warranty. Shows that the manufacturers believe in the durability of their product. The rim height is fixed at 35 inches and cannot be adjusted. The super-tough polyethylene basketball hoop base is 40W x 24L x 10H and holds 25 gallons of water - weighs 200 lbs. when filled with water. With 3 pool hoops by dunnrite, you might start to think that this is a sponsored post. But we can’t help it. Dunnrite creates pool hoops so good we cannot get enough. The splash and shoot comes with a height adjustment feature that is must for most families. A beautiful color scheme and minimalistic design that goes well with any kind of outdoor pool. 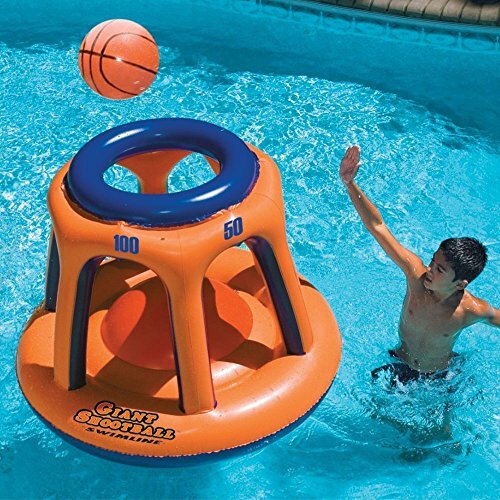 Compared to in-ground and portable hoops an inflatable basketball hoop is actually inside the pool with you and floats on water. 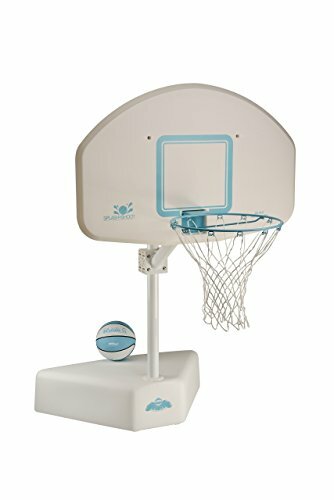 Purchasing an inflatable hoop is a great option if you have young kids and want to have some great pool fun that isn’t necessarily basketball related. The hoop comes in a brilliant yellow and green color. This is a great hoop if you are looking for a fun game in the pool with your kids. The ball provided feels really cheap. This hoop stands at a massive 45-inches and is almost 36-inches wide. The entire system is made from a really durable vinyl that should last you at least a summer. Even though it’s tall, the hoop doesn’t tip over like other giant inflatable hoops. This is thanks to it’s large base that keeps it pretty sturdy. Another nice touch is the scoring numbers on all sides. The manual doesn’t explicitly mention how you can incorporate them into a game but we are sure your kids will invent new games using them. 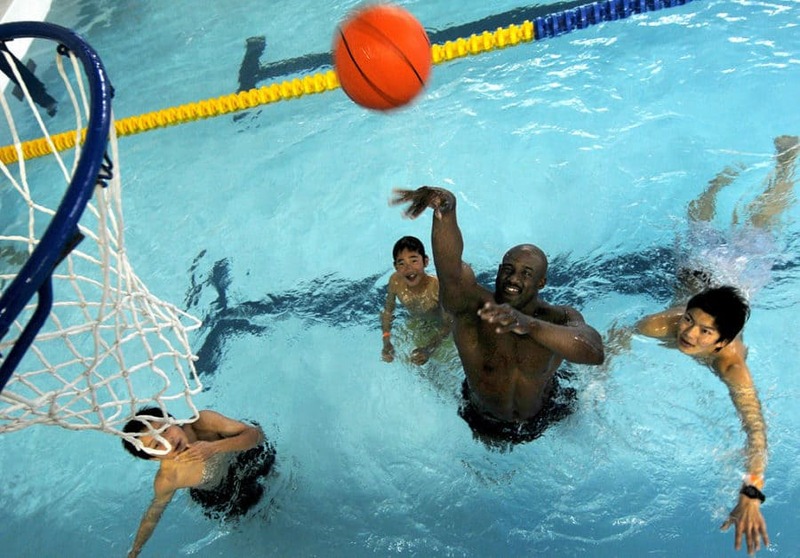 Now that we have discussed the best pool hoops of every kind. Let’s drill down to the exact system that is right for you. Children need a hoop that’s a bit lower. I’d recommend you to go for an inflatable hoop if you have kids younger than eight. You could also opt for a hoop with some height adjustment mechanism for some flexibility although these hoops tend to cost a bit more. On the other hand, adults and teenagers should focus on a sturdy basketball hoop that can handle some rough use As a rule of thumb, the younger your kids the less you spend on the hoop. Rust is one of the most common issues with pool hoops and surprisingly not many buyers account for it. That’s because the entire pool hoop market is based on selling features you don’t need rather than focusing on what is important. Ask yourself are the bolt and metal on your system rust proof? Rust is one of the main reasons people are forced to throw away their old hoops. You don’t want your deck and pool full of rust stains and saltwater is particularly harmful to metals. If your system does not come with an anti-rust coating you should use at least use rust guard spray to keep it protected. Do you prefer a portable system or one that’s bolted to your deck? Portable rims are flimsier than their in-ground counterparts. This is a trade-off you are going to have to make. If it’s a portable system, how easy is it to move? Would you be able to move the hoop into the garage during winters? How safe is the hoop? Let’s face it. You’re going to dunk on this hoop. Just be safe while doing it. You don’t want your system to break and injure someone. How safe is the system you are purchasing? Can it handle the kind of abuse it is eventually going to face? You spent a boatload of money on a house with a pool. Do you really want to ruin its appearance with an ugly hoop just because you didn’t want to spend an extra $10 on a better-looking one? What should you look for in an inflatable hoop? Is the height appropriate for your kids? In case of inflatable hoops, bigger is not always better. Pick a size that’s appropriate for your kid(or whoever is going to be playing). Does the hoop stay upright after a hit or topple over easily? It’s a buzzkill to play on a hoop that topples over after even a little bit of contact. You then have to stop the game to set-up the hoop before you can continue. Dunnrite is the boss when it comes to pool toys. 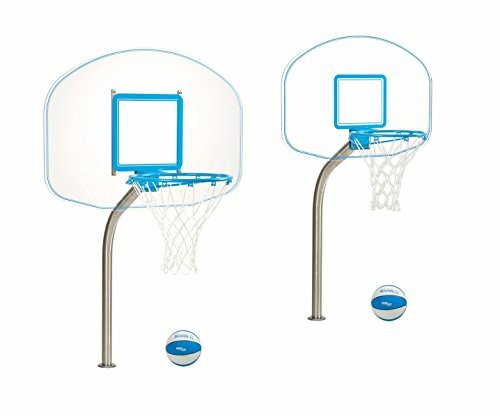 In fact, they have been creating pool toys since 1983 and also own some of the most popular basketball hoop models in the world. But you would be surprised to know that they are a family-owned company based in Indiana. Swimline is the story of the American dream, a young man( Herman Schwimmer) moved to the US after the world war 2 in 1948. Starting with nothing, he founded swimline which has now become THE name in the swimming pool industry. They own one of the biggest manufacturing facilities in New York which is over 125,000 square feet. Can I Hang On The Hoop? Hanging from the rim of a portable hoop is forbidden. It doesn’t matter how much you spend on your basketball system or what the manufacturer says. No portable rim can hold the weight an adult for a long time. The rim is going to snap and you’re going to hurt yourself. 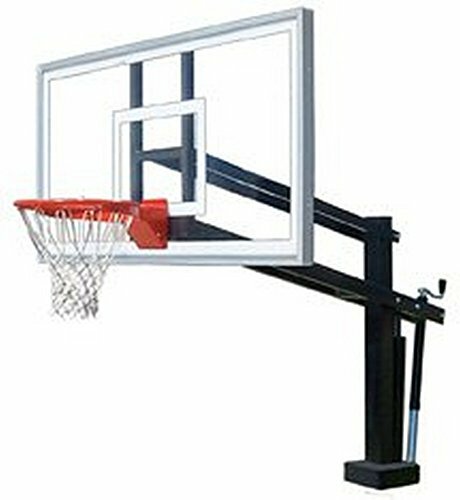 Can I install an In-ground Hoop by Myself? While you can install a deck-mounted hoop all by yourself. I’d recommend you to go get some professional help unless you’re in construction. Your time is better invested enjoying the summer rather than drilling holes in your deck. One of the risks with doing it yourself is that you may mess up the size of the hole you drill and this could really complicate things. The kind of hoop you will want really depends on your situation. If you are looking to purchase a pool toy for your young kids without spending too much. Then I’d recommend you to go for an Intex floating hoop. It’s cheap and surprisingly fun to play. But if you are looking for a fun, casual inflatable hoop both adults and kids can enjoy. Then you should get the Swimline Giant Shootball Hoop. 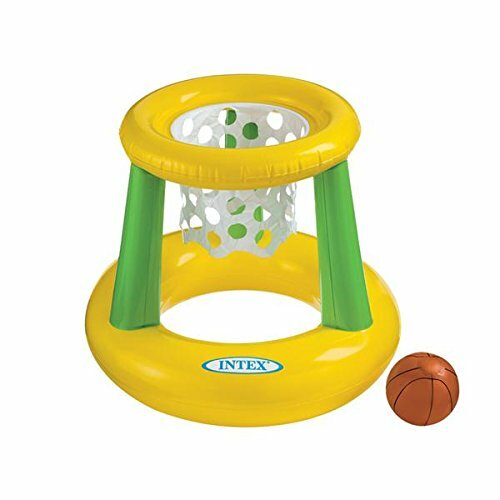 Do you have teenage kids who are looking for some competitive games, go for a portable hoop or even an in-ground option. An in-ground hoop is a long-term investment but it takes a lot more work to install. Our favorite hoop is the Dunnrite Clear Swimming Pool Hoop. Not only is it extremely durable and rustproof, but it’s also minimalistic design fits almost every pool environment.